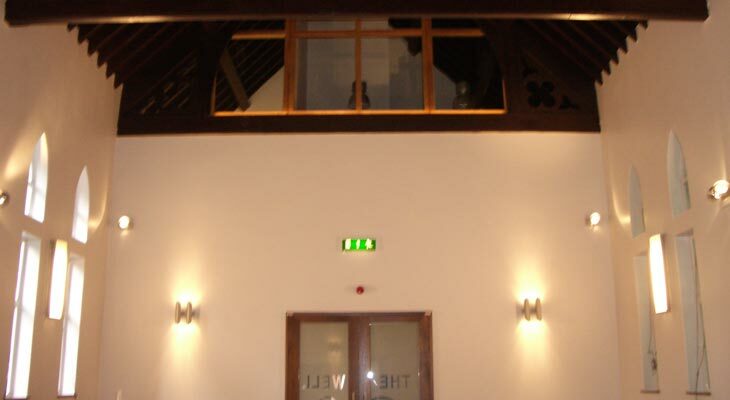 TJ Electrical contractors in Croydon installed electrics, lighting and a fire alarm system in London at St Pancras Hospital, London, as part of a refurb to an old chapel building which had not been used for some time. TJ Electrical contractors in Croydon undertook a very interesting project comprising electrics, lighting and fire alarms in London at St Pancras Hospital, London. 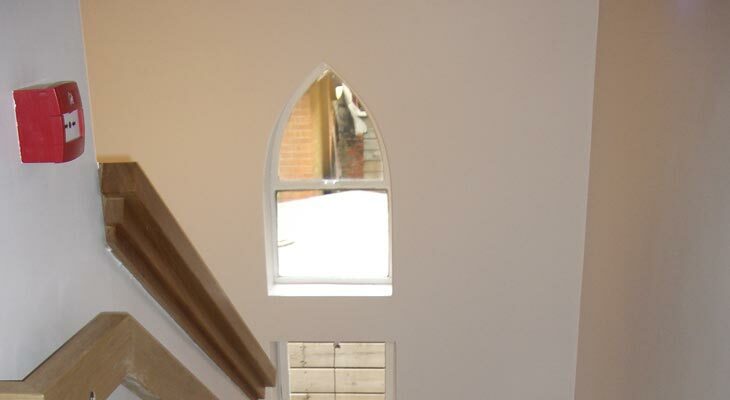 The hospital was refurbishing an old chapel building which had not been used for some time in an effort to turn it into a spiritual centre for St Pancras Hospital, called The Well. The tasks for our TJ Electrical Croydon electricians included installing a new fuse board and new electrics for the building, as well as new lighting and a new fire alarm system. The fire alarm was linked to the main hospital so that in event of the fire alarm being triggered, security and maintenance staff would be automatically notified and have a specified amount of time to investigate and take action before the main fire alarm automatically sounding an evacuation order. If you require electrics, lighting or a London fire alarm company then please don’t hesitate to contact TJ Electrical. We are here to help. Lobby entrance to The Well. Here we installed recessed down lights and a smoke alarm, together with the building’s fire alarm control panel (out of shot). Whether fitting fire alarms in London or anywhere else, the fire alarm control panel should always be near an exit point. We ran a new sub mains to bring power to the building and installed a split load MK distribution board. Below the board we added key switches which act as the testing facility for the emergency lighting (one of which we fitted inside this mains cupboard). A third party lighting designer specified the lighting for The Well. 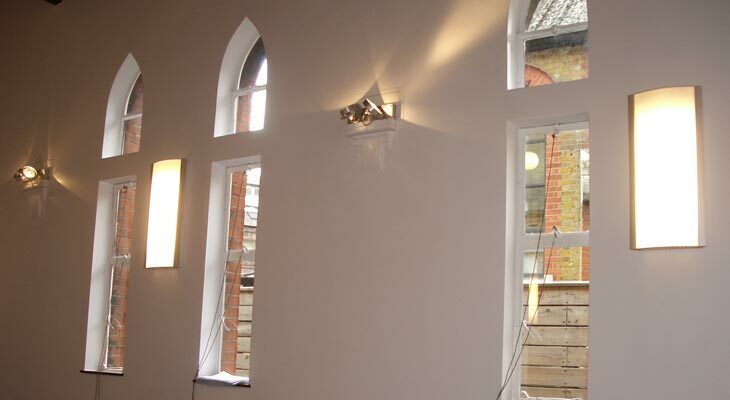 As lighting specialists in Croydon we then supplied all of the materials and fitted to the designer’s spec. 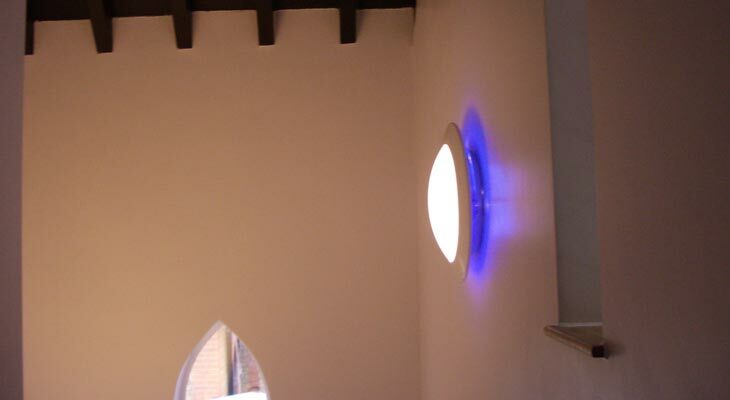 We surface mounted energy efficient circular lights with blue neon rear reflectors on the staircase. 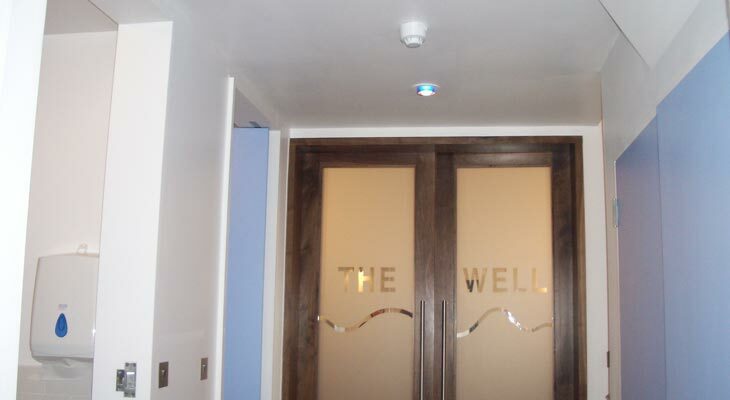 This electrical contracting project included emergency lighting in London at The Well. 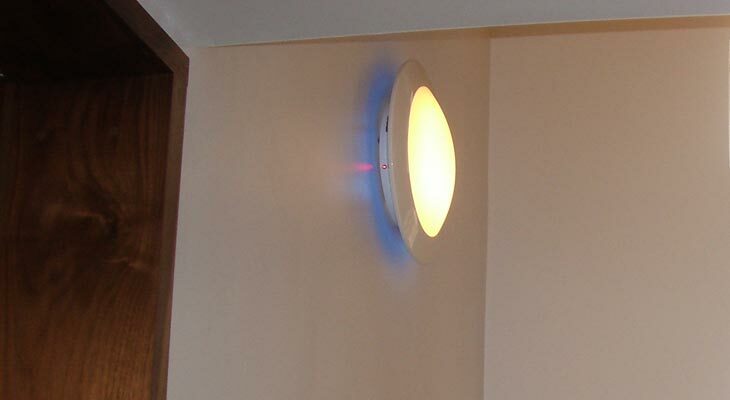 Here we see a battery powered little red neon emergency light fitted within one of the “flying saucers” ready to provide sufficient lighting to travel down the stairs in darkness. A call point at the top of the stairs outside the viewing window room, fitted our Croydon fire alarm specialists in London. If this call point is triggered it will notify the hospital’s security room, allowing them specified time to investigate before the main fire alarm automatically sounds. Because of the high ceilings, we installed high bay lighting suspended down on wires (with the power cable to power the lighting tracking down the wire). Suspending the lighting made it easier for maintenance to be performed on the long lasting powerful lights. During the refurbishment the customer stripped everything back with a plan to line the walls with thermal board to better insulate the building. 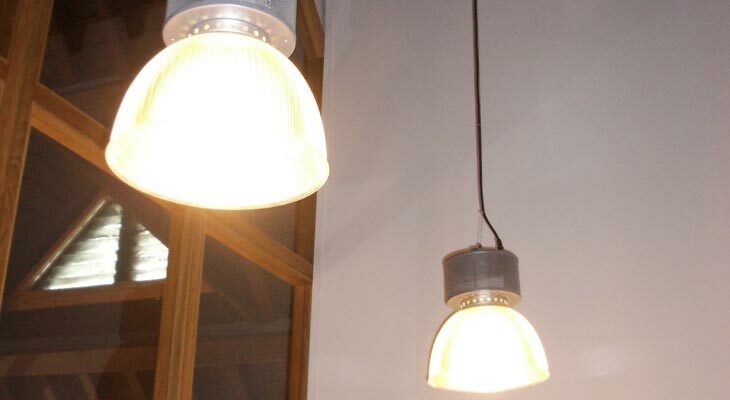 With everything stripped back, our Croydon lighting specialist installed the electrics for the lights in conduit and left fitting positions ready. The customer then dry lined enormous sheets to the walls which hid the electrics, but with the fitting positions still there. 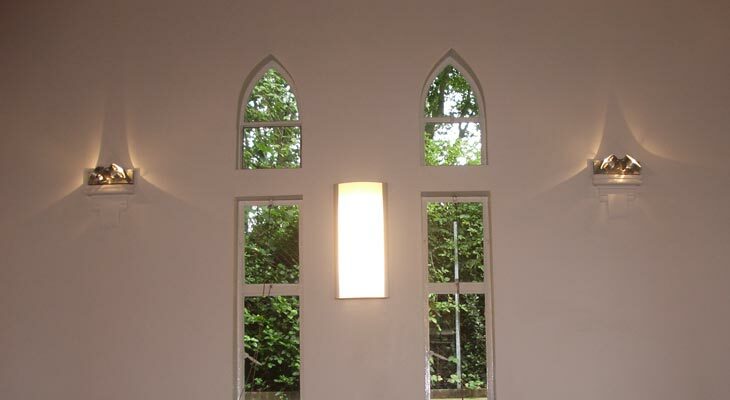 Our Croydon lighting specialists then connected up the lights to produce a very subtle lighting effect on the external church like windows. 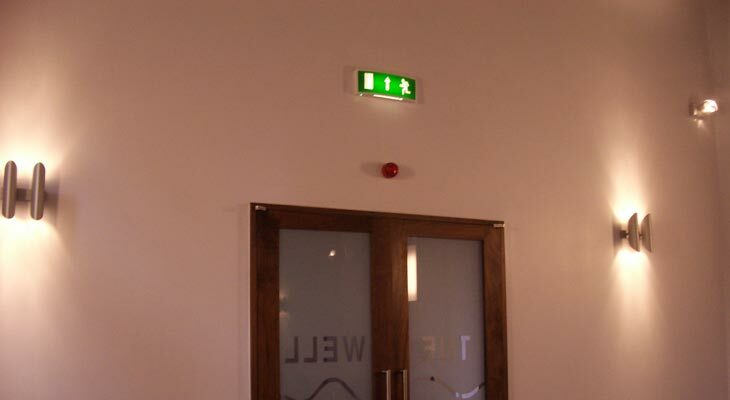 During the installation of the fire alarm in London at The Well, our fire alarm installers fitted a sounder in the main room over the exit door together with a green running man emergency exit sign. We also added more of the subtle wall lighting here as well. The main room and upstairs viewing area at the finish, with all lighting, electrics and the fire alarm installed and tested. 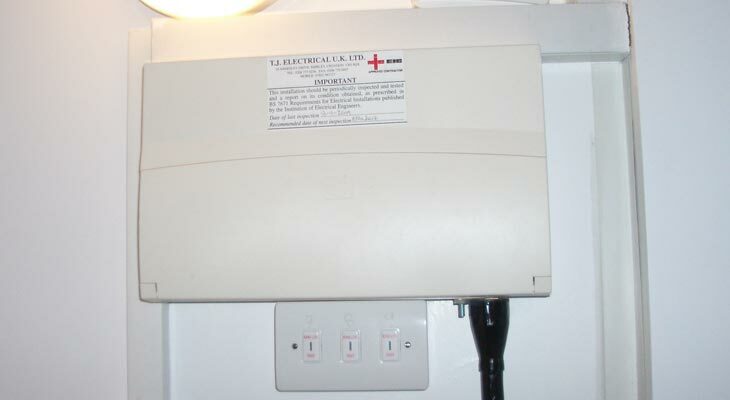 If you require a fire alarm company in London or electricians and lighting specialists in London, then TJ Electrical contractors in Croydon are here to help.